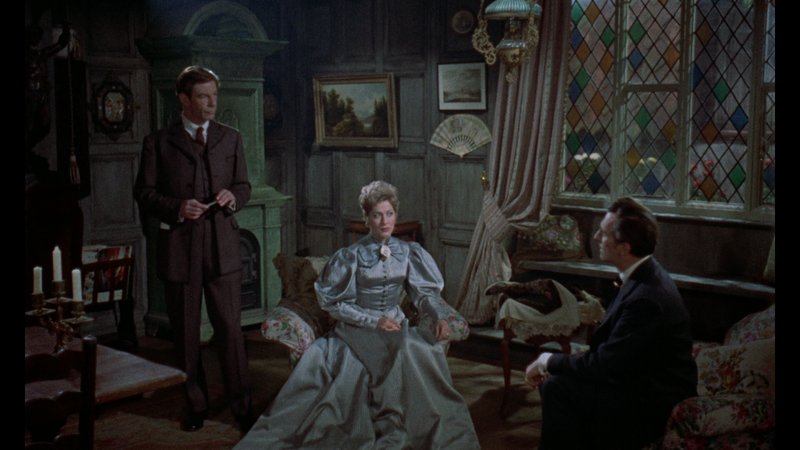 Jonathan Harker: [narrating his diary] It only remains for me now to await the daylight hours where I will with God's help forever end this man's reign of terror!. 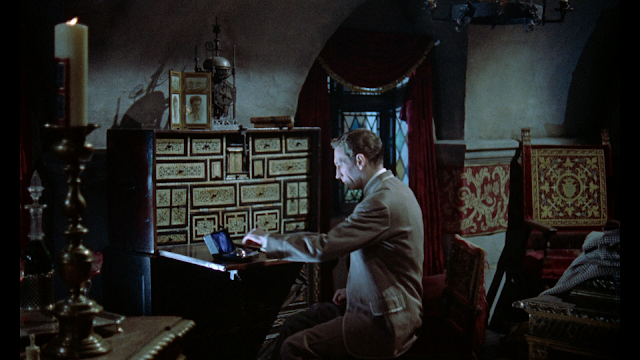 Both versions are basically the same film except that the 2012 Hammer Restoration contains extensions to two scenes found in the film. 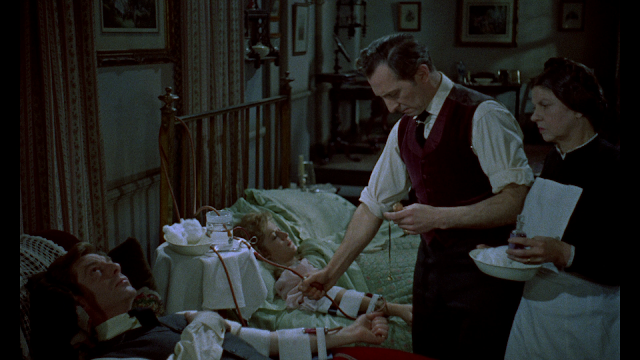 The BBFC did not approve of the sexuality in one scene and the graphic nature in which Dracula dies. More on this a bit later. 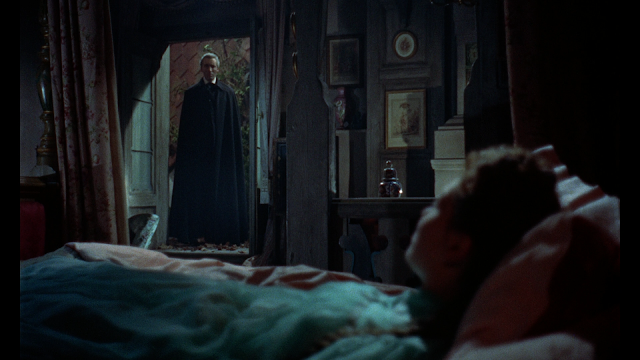 Dracula was a huge film for Hammer. 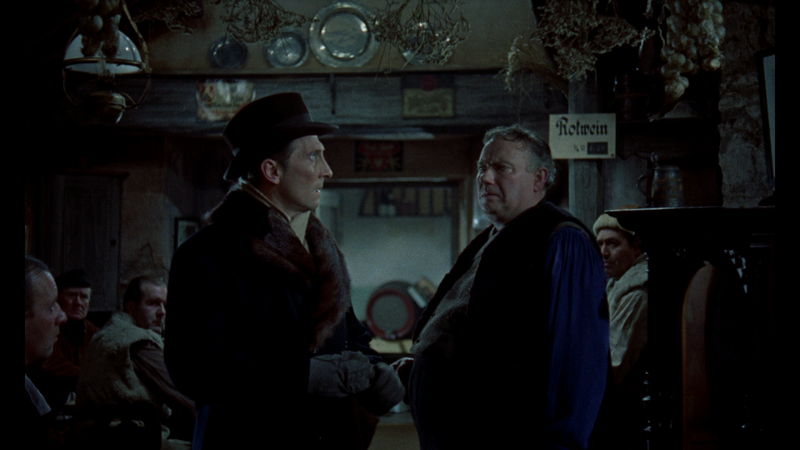 They had made two films before this: The Quatermass Experiment, which was a sci-fi film and The Curse of Frankenstein, which was their first foray into horror. They needed to prove that they were no joke and chose to adapt the Bram Stoker novel. Hammer partnered with Universal Pictures because they owned the rights to the novel and the character. 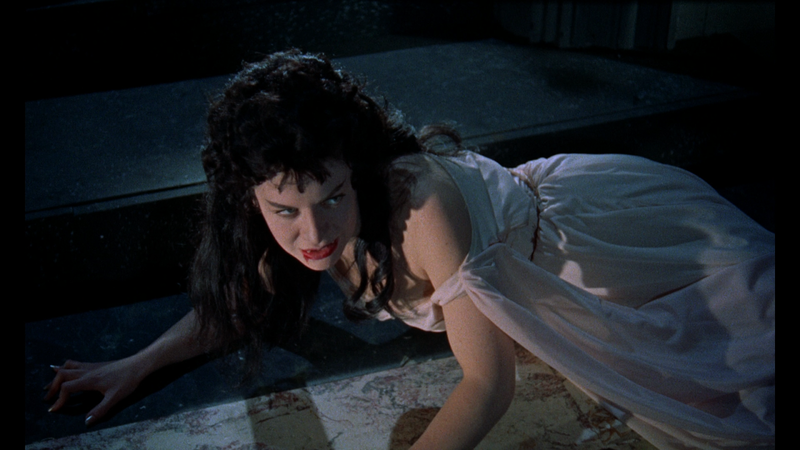 Hammer also was able to release the film through Universal in the states which meant that more people would see the film. 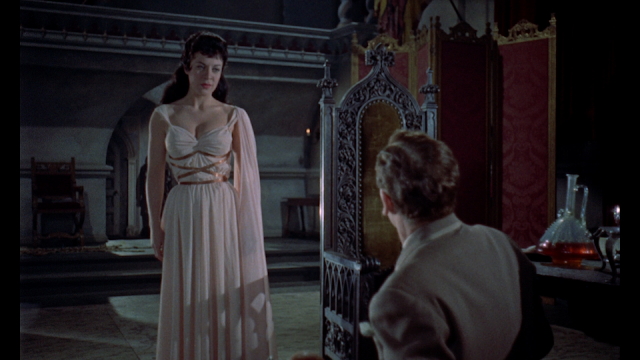 Talk turns to how the novel was adapted (the novel is huge and Hammer did not have the budget to do everything). In fact the film was is considered a low budget film. 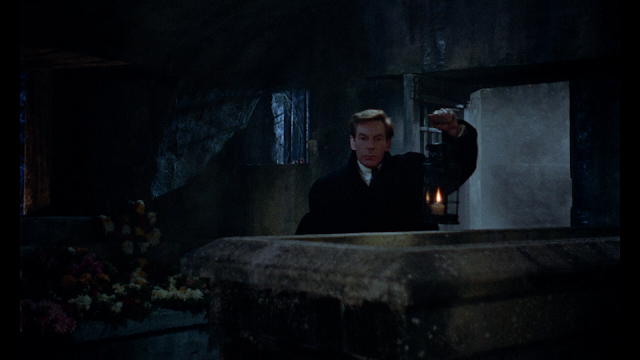 The casting of Peter Graves and Christopher Lee is discussed as well as how the film was received and how it plays today. Both the 2007 and 2012 restorations are covered in this featurette. The footage was thought to be lost, but there were rumors that the footage was included in the Japanese version of the film. After years of trying to find the footage, it was found in the National Film Center at the National Museum of Modern Art, Tokyo. A fire had broken out there and all was thought to be lost until it was discovered that the last four reels (6-9) had been upstairs in the center being cleaned and respooled. The footage was in terrible shape and would take months to restore. The restored footage was reinstated and the film is now as it was before the censors got a hold of it. 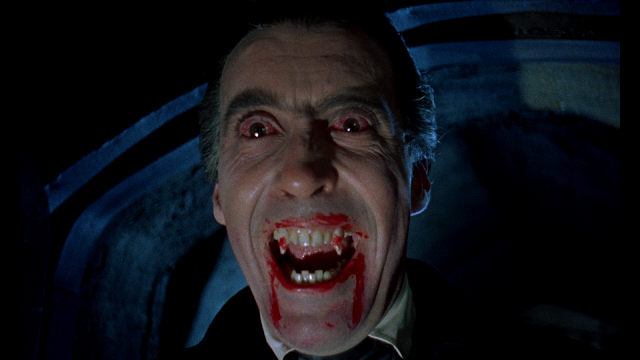 Film Historian Christopher Frayling gives us a history of not only the 1958 version of Dracula, but of the book, Nosferatu, and the Universal Dracula. He points out that this is the first time that a British actor has played the role. Frayling also talks about the differences between the novel and the film. He then speaks, at great and interesting length, about the censoring of the film. Denis Meikle, author of History of Horrors , gives us a very detailed account of the battles the filmmakers had with the BBFC, from script to final film. 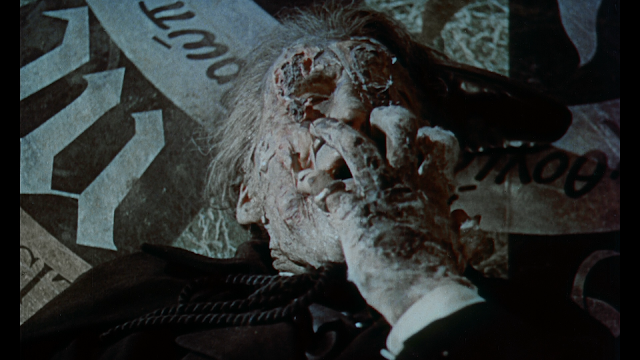 When the censored scenes were found in Japan, they were in terrible shape. These are how the reels looked before being restored. Narrated by Oliver Reed, this is a series that ran in 1994, with 13 episodes in all. 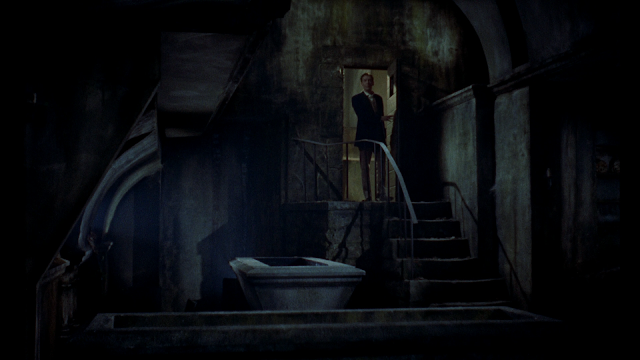 Each episode has a theme and the footage is taken from the films of the theme. Not a big fan of The World of Hammer, but it is there for people who are into that sort of thing. 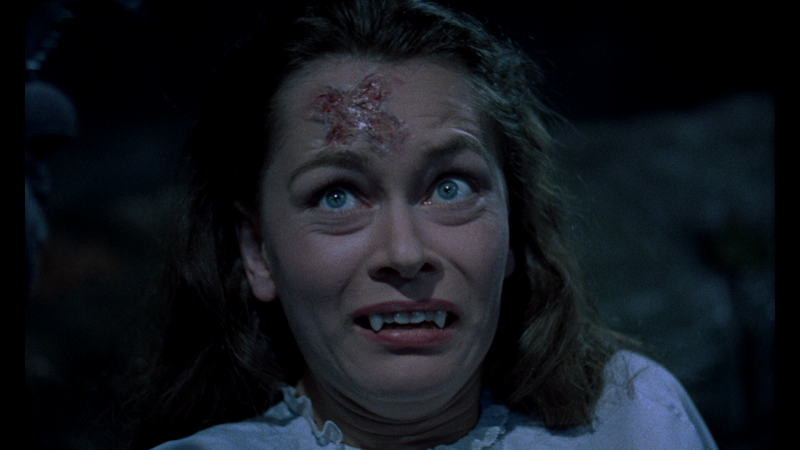 When Dracula was shown at the Vault Festival, lost reels and all, film critic Kim Newman introduced the film and actress Janina Faye (Tania in Dracula) read a chapter from Bram Stoker’s novel. I found the extras here to be pretty darn cool. I do think that the talk about the censored scenes was a bit too much (after a while it is like hearing a song on repeat over and over again), but I did find some of it to be really fascinating. I found Frayling’s discussion on the film to be interesting and engaging. 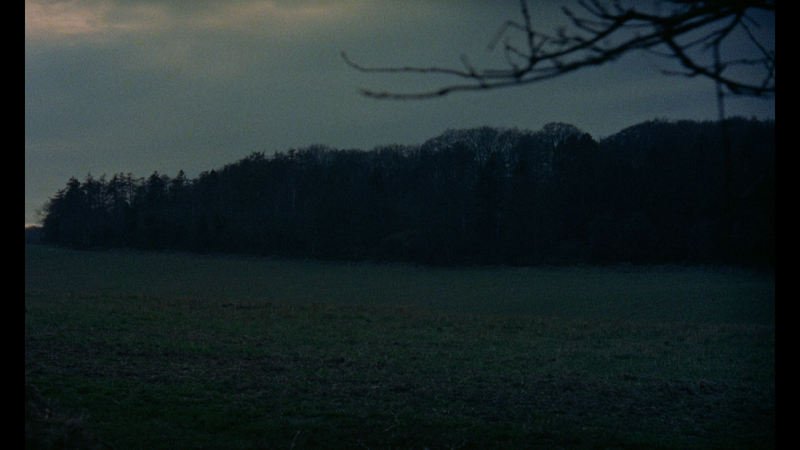 The Japanese reels are there just for completest, but watched much of the footage as I got lost in it. I can do without the World of Hammer segment, but everything else is worth the watch. 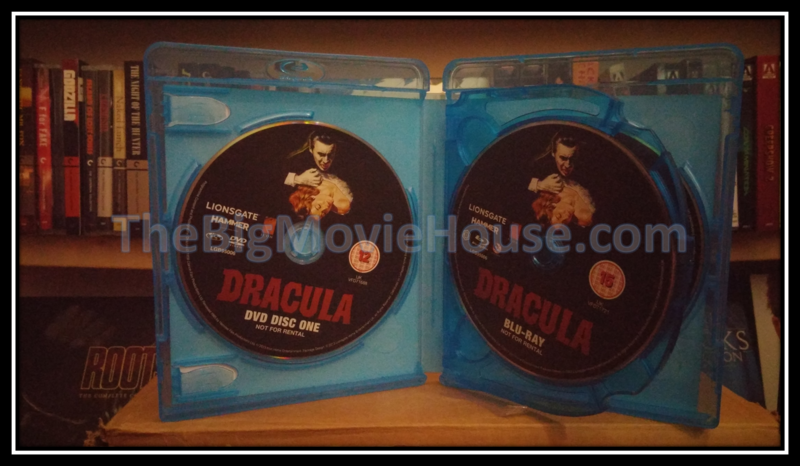 Dracula comes to us courtesy of Lionsgate, which is a real shocker because they hate releasing horror films on blu-ray, at least in the states. 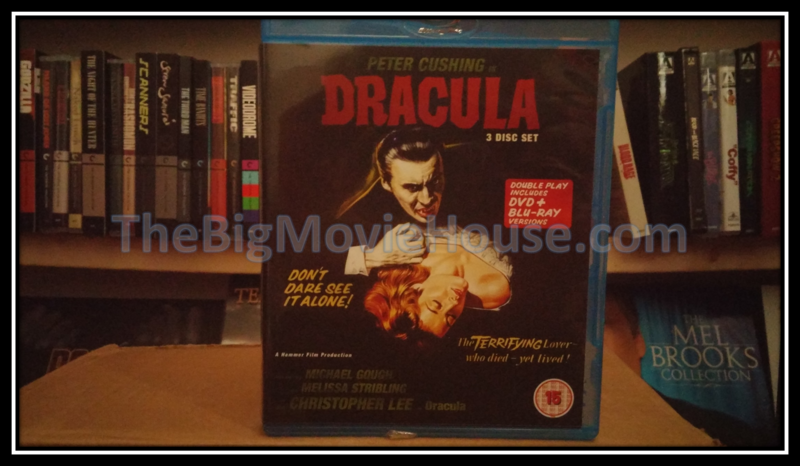 The front cover is the film’s theatrical poster depicting Dracula going in to bite a female victim. A few taglines are present as well as the names of the leads in the film. A ratings button appears on the bottom right of the cover. The back cover gives us all of the special features included in this set as well as a plot description. Down towards the bottom we get all of the technical info as well as the same rating button that appeared on the cover. There is also a “Not for Rental” warning, which is another thing we don’t have in the states. There is no reverse cover art. 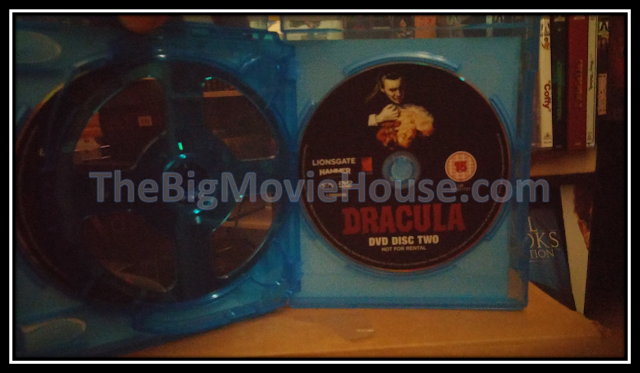 Inside we find three discs (1 blu-ray and 2 DVDS). All three of the discs contain the same disc art only differentiated with the label of which disc is which. Both restorations are the same except for the added footage in the later. This means that the transfers are the same. I found this transfer to be very good. There is a nice layer of grain and the colors look natural. Skin tones are nice and blacks are nice and deep. The picture quality does change ever so slightly when the new footage is shown. With all of the work that was done, it is amazing that the footage doesn’t look worse. Outside of that this is a nice transfer. The soundtrack, a LPCM Mono track, is a nice as it can be. The score James Bernard is heard loud and clear. There really isn’t much else to the track. I did not hear any distortions in the track and the dialogue is clear and crisp. I am glad that I picked Dracula. librarian, which means something different in the U.K. than it does in the States, I think). 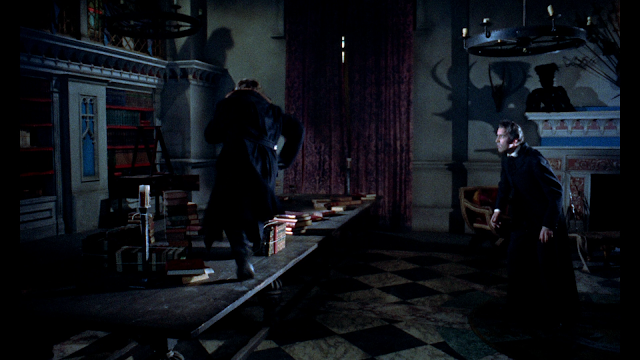 Anyway, Harker is going to be cataloging Dracula’s books, but has an ulterior motive: he is going to kill Dracula. I loved this change from the book to the screen. 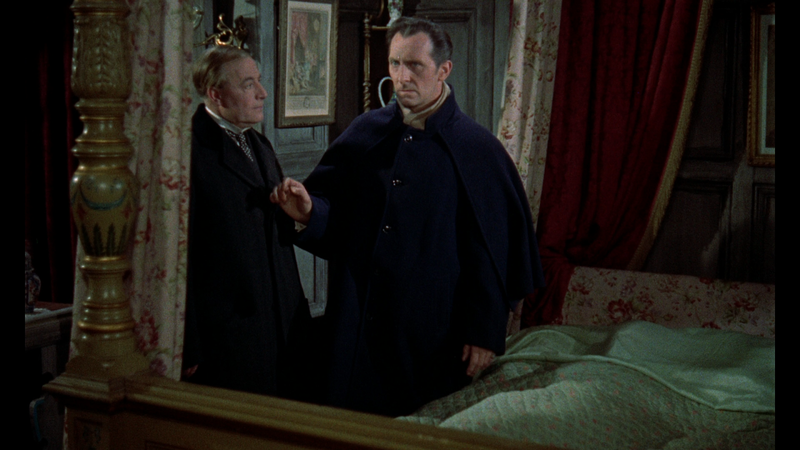 In the book, Harker is sent to the castle as a legal advisor and gets caught up in Dracula’s world. Here, he already knows about Dracula and plans on killing him. 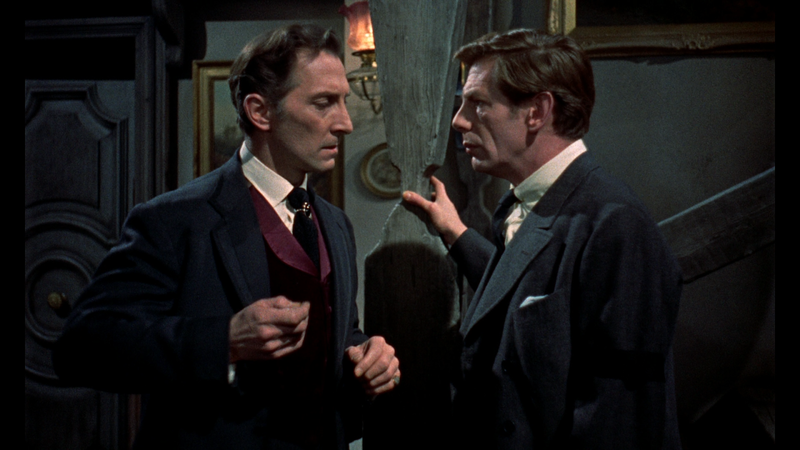 It makes total sense too as Harker is a friend of Van Helsing, the man who has been studying vampires. The change is important as we think that we are going to be following this character for the duration of the film, but he is killed off as he tries to kill Dracula. This is something that we don’t see in films that often. 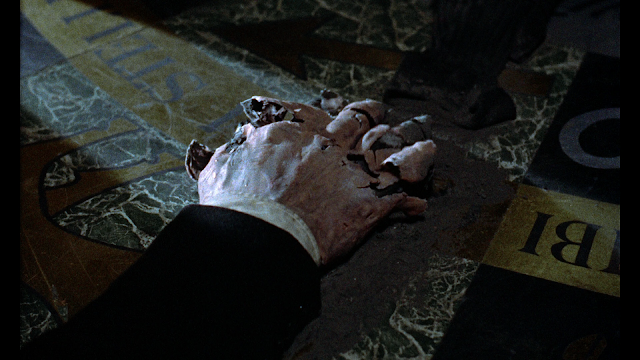 Two years later, Alfred Hitchcock would do the same thing in Psycho by killing off his main character a third of the way into the film. After Harker’s death, Van Helsing (Peter Cushing) goes to the castle to find out what happened to Harker. He finds Harker’s body and vow revenge against the thing that killed his friend. 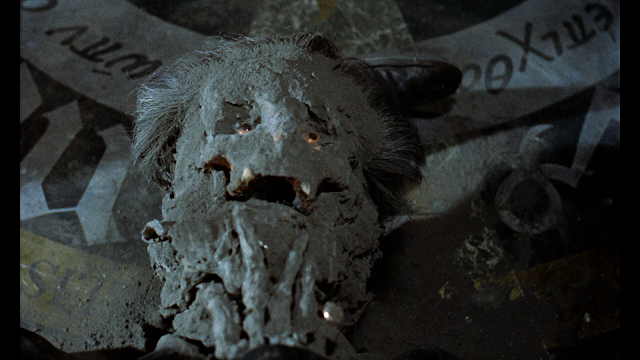 One of the first things that you will notice about this film is the gore. The film is not overly gory, but, for the time, it was. 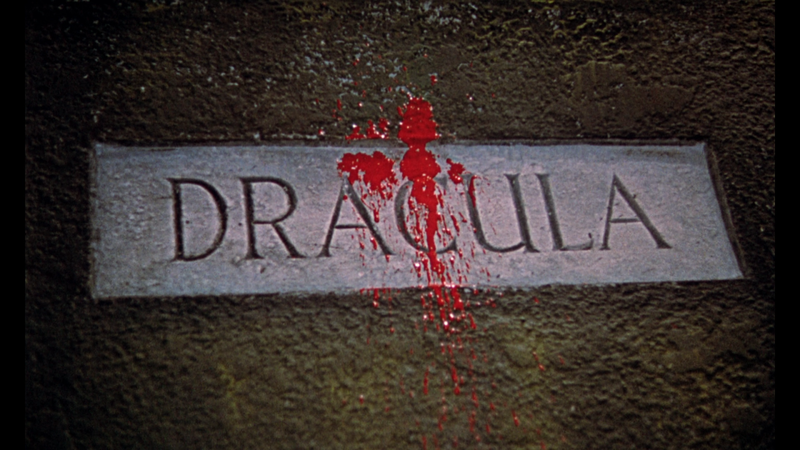 The first time that we see Dracula’s coffin, blood drips onto it and shows the world a shade of red that they had never seen before. Elsewhere, there is some blood here and there and this was the first time that an audience would see such things. The other notable thing is the portrayal of Dracula himself. Christopher Lee embodies the character with a charm that we haven’t seen in the characters before. 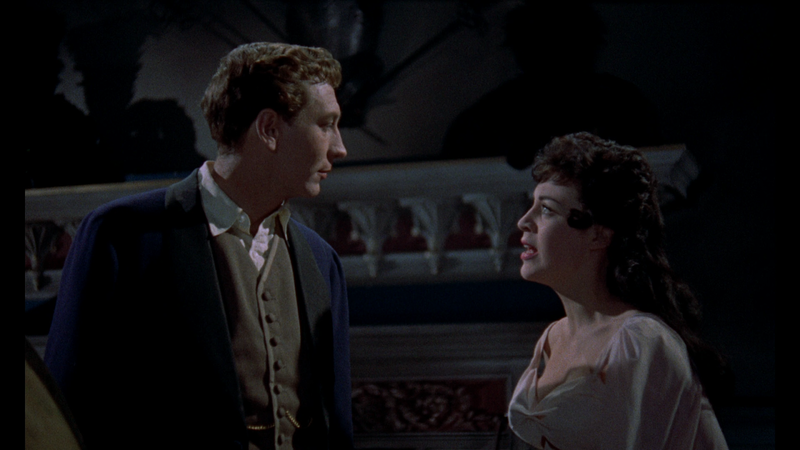 Bela Lugosi had none of this charm. 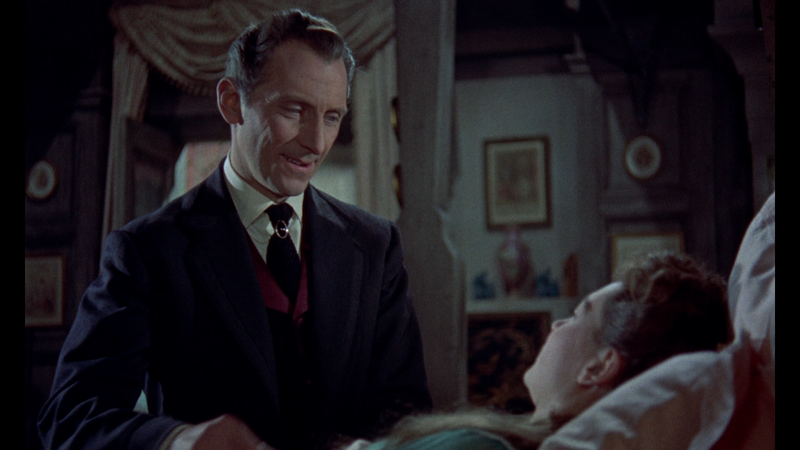 Lee’s Dracula can convince you to do anything. 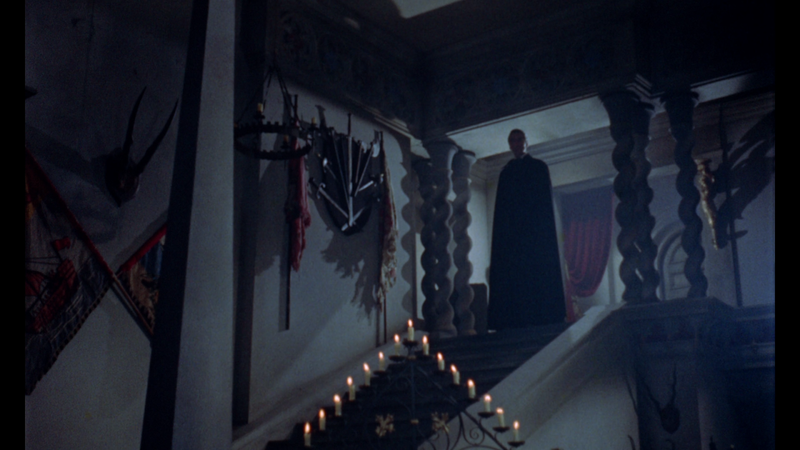 The first time we see Dracula, he is standing at the top of a staircase, just like in the Lugosi version. 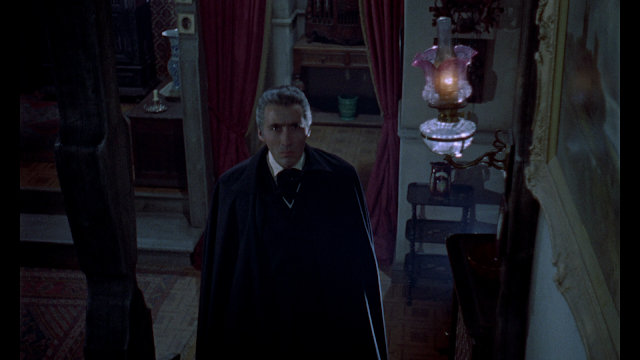 This time however, Dracula comes down the stairs with a kind of skip in his step and greets Harker very warmly. 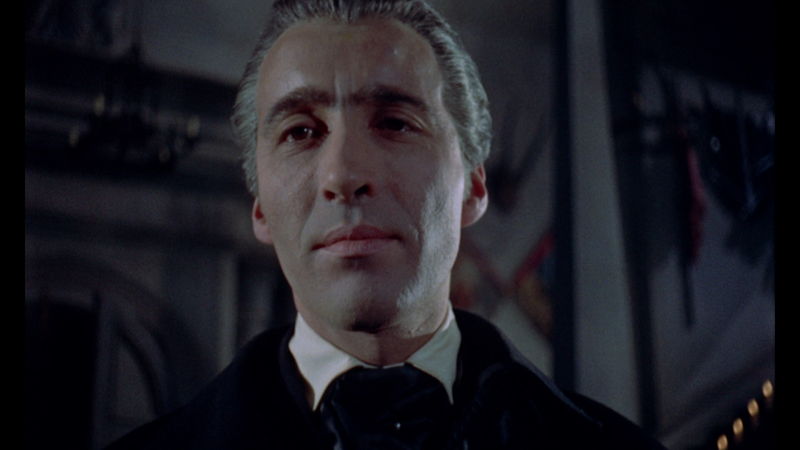 Even though we know that Dracula is up to no good, the characters don’t (we most of them don’t) and his façade of good nature is captivating. Lee is brilliant in the role too. He can be a nice guy or terrible monster. 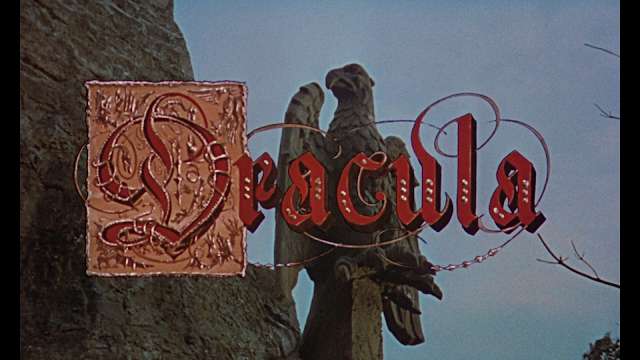 Dracula (or Horror of Dracula because we Americans can’t help ourselves when it comes to titles.) is an excellent film. Today’s audience will find it slow and boring, but that couldn’t be further from the truth. 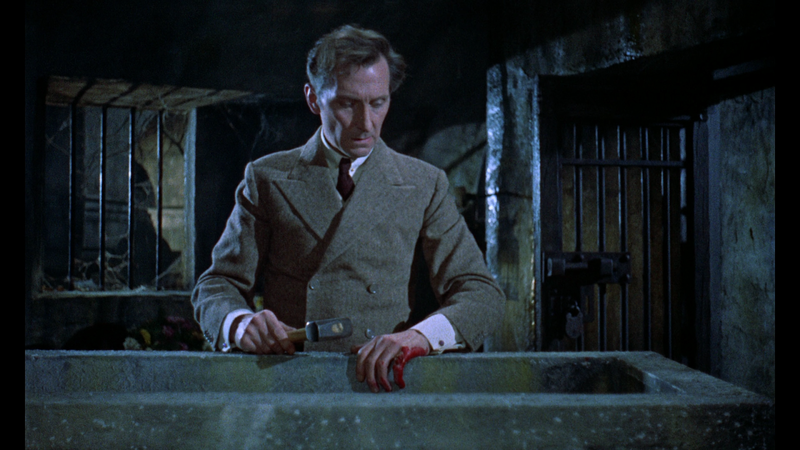 Both Lee and Cushing are excellent and the direction by Terrance Fisher is top notch. I found this version of Dracula to be way more exciting and bearable than the Lugosi version. I look forward to watching the other films in the series. 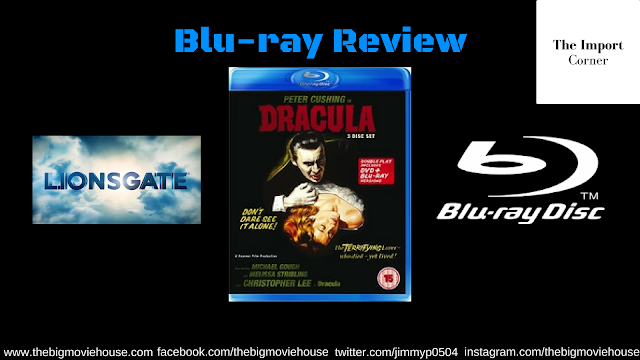 A really good film deserves a really good blu-ray and Dracula lucked out. The picture and sound are very nice and the special features package is well worth the time. The packaging is a bit disappointing, but it doesn’t take away from the film and the special features. This is a REGION B disc so make sure that you have a REGION FREE player if you are outside of the region.